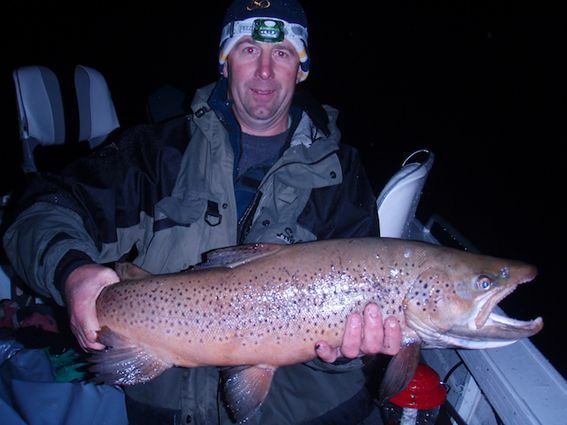 Rain and plenty of it on the weekend has boosted the quality of the river fishing sky high. This week will be known as 'big fish only week'. Read on and you will see why. 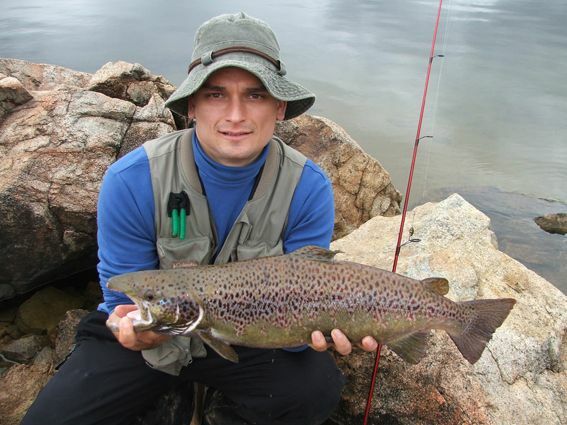 Rivers:- Have been sensational with both the Eucumbene and Thredbo rivers flowing high and at times dirty but not enough to deter anglers who have been getting some exceptional fish. *Phil Brumby has been in the thick of it catching ninteen fish in a session. A staggering nine of these fish were over the old fashioned ten pound mark, with one of those weighed in the net before being released pulling the spring to fourteen and a half pounds! The fish pictured below weighed twelve pounds. With water levels higher this week, more weight in your flies or on your leader can be important to reach the fish on the bottom. Beadhead nymphs seem to be better performers on browns while globugs have been the favourite pattern for the rainbows. Early starts are a key to getting the most out of the rivers at present though on some mornings icing guides are an issue. Fishing the harder to access areas will improve your chances greatly. 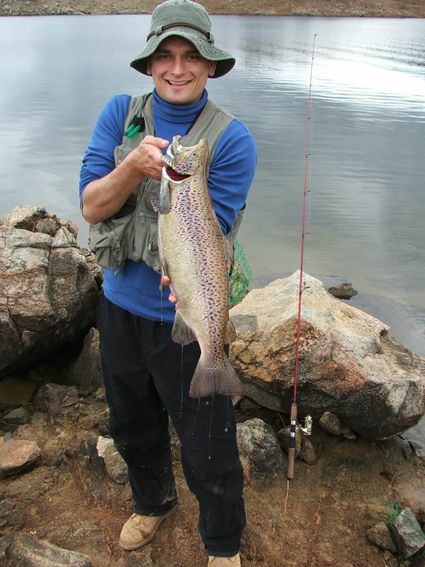 There have been some good rainbow poking around during the day and provide plenty of fun when conditions allow. The edges are a bit sticky but with kilo-ish fish around worth the effort. 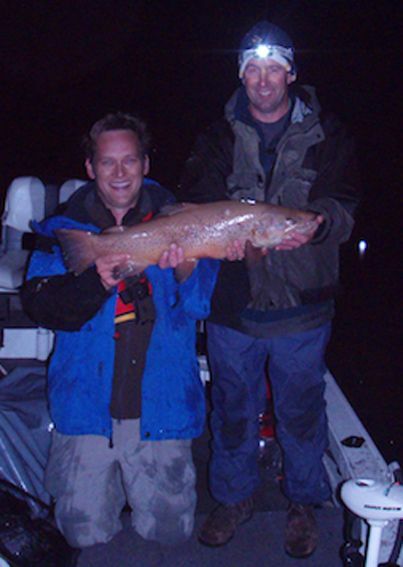 *Mark Bulley and Danny Spelic from Canberra had a great nights fishing at Eucumbene recently. After catching around 30 rainbows and some nice browns on Wooly Buggers and Pillow Flies, nothing could prepare them for what was about to happen next. After fishing for several hours after dark, they decided to call it a night and head back to the boat ramp at around 11:30pm. As they slowly manoeuvred their way out of a shallow bay under the light of a full moon, they spotted a fish in the shallows that looked like a mini submarine holding close to the surface. After re-positioning the boat and a quick cast, Mark managed to hook the fish on a 6 weight fly rod and black wooly bugger. It weighed in at 4.83kg - a touch under 11 pounds in the old scale and measured 74cm long. Not only was it Marks first ten pounder, but he also christened his new net which had a serious work-out on its maiden voyage! 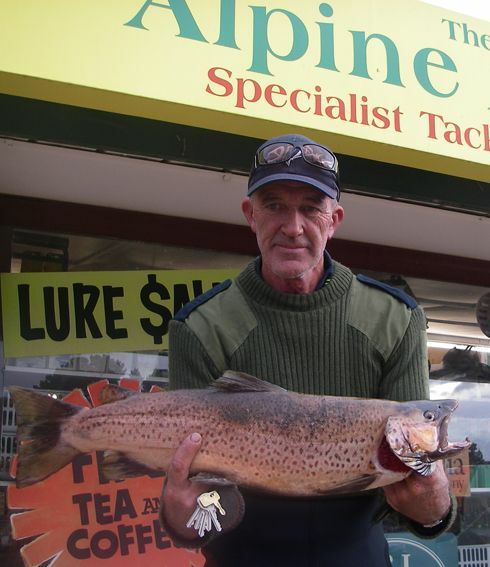 Jindabyne:- Has produced a few nice fish on the troll with pink and yellow wing Y62 and Y94 being the pick of the tassies. Vibes in the Rayza brand have been excellent as have the strike pro vibes. Fished on three colours of leadcore these have been very productive. *Ivica Djuric had a nice spin session in the lake on the weekend catching this 62.5cm fish on a Mepps Aglia spinner. Ivica suggested that the trigger of this catch was the glare caused by the combination of sun and the gold blade of the Mepps lure. The fish hit the lure on the second cast after the sun briefly shone through the clouds. Bait angler have had some good sessions again this week with Powerbait taking some good catches. Scrubworms have been good, with grubs still producing the odd fish. Rainbows are loving Powerbait and Scrubbies in the Buckenderra arm and also Seven Gates with many anglers catching their bags. Lime twist and Chunky Cheese have continued to be the popular favourites this week.